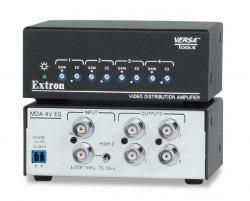 This one-input, four-output composite video mini distribution amplifier provides 150 MHz (-3dB) video bandwidth with gain adjustments to allow for compensation of signal level loss that occurs over long cable runs, while EQ adjustments compensates for high frequency loss. The MDA 4V EQ is compatible with NTSC, PAL, and SECAM video signals, and allows for cable runs of 600 feet (180 meters) to 1,000 feet (300 meters) or more, depending on the quality of the coax cable. It also features passive loop-through capabilities, which provides the ability to add more amplifiers and create a larger DA system or drive a local monitor.